Official releases of the IFC specification are listed here, as well as their components including HTML, EXPRESS, XSD/XML, and OWL documentation and formats. Release Notes for all versions can be found here. The table IFC Release Database was last modified at 2019-04-10 13:47:21 by Jeffrey Ouellette. 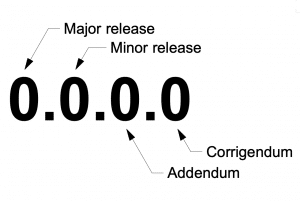 IFC versions are identified using the notation "Major.Minor.Addendum.Corrigendum". Minor versions consist of feature extensions, where compatibility is guaranteed for the "core" schema, but not for other definitions. Corrigendums consist of improvements to documentation, where the schema does not change though deprecation is possible. The latest version, IFC 4.1 is recommended for all current developments, which is fully backward compatible with IFC 4.0. Core definitions within IFC 4.1 and 4.0 are backward compatible with IFC 2x3 TC1.